Gallery 1855 is pleased to announce the solo exhibition of artist Cathie James-Robinson. Cathie is an accomplished artist in a variety of artistic mediums. She has shown regionally at a number of local galleries. Her latest exhibition will run from January 5-January 30, 2018. The open house with light refreshments will be held Sunday, January 7th from 1-4:00pm. Cathie James-Robinson has spent her life creating art, from technical drawing to fine arts working in all types of media, including painting (with watercolor, acrylic and soft pastels), drawing (graphite, color pencils and ink), sculpture of all types, assemblage and fine art photography. Originally a self-taught artist, Cathie decided to attend American River College in 2008 where she discovered an amazing and talented faculty in the Art and Photography departments. It was there that she received degrees in Art and Art New Media as well as the Certificate in Freelance Photography. During her time at ARC, she was published twice in the national award-winning American River Magazine, as well as participating in numerous student exhibits, winning Best 2-D in show for her pastel, “Moody Mountain View”. After soaking up all of the knowledge and processes she could and honing her skills, Cathie became increasingly interested in combining her fine art, photography and assemblage into single mixed media art pieces. The art in this show has been created using the artist’s original paintings, photographs and drawings, as well as hand-made stencils and stamps. The repeated ink drawings and photographs used in the art have been reproduced from her originals and applied with unique transfer techniques. The hope of the artist regarding this exhibit is that these nature and vintage inspired pieces communicate the stories of emotion and relevance with which they were imagined. 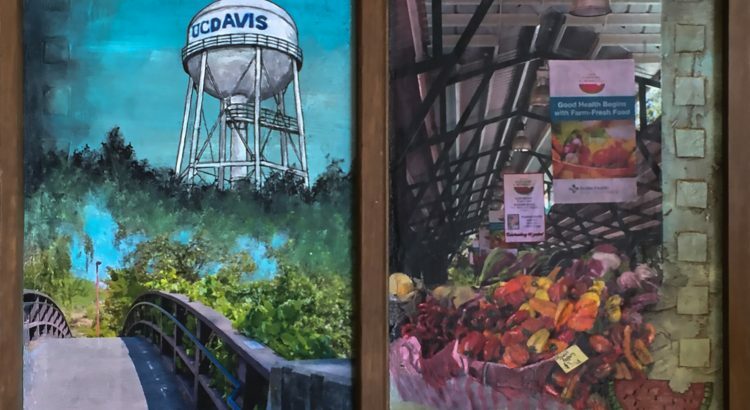 Formerly known as Cathie Bechtell, a resident of the Foothills of El Dorado County for 35 years, she has lived in Davis, California for the past 2 years and has fallen in love with the lifestyle and art community.